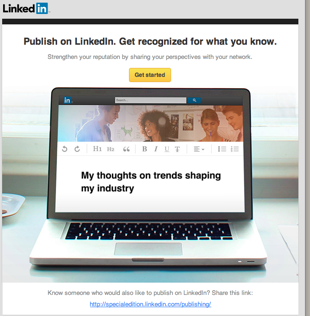 Even if you haven’t yet seen an email like this in your inbox, this is great news for all of us: LinkedIn has decided to allow members, not just influencers, to publish “long-form” (essay type) posts to be shared with your connections and followers. Your post will showcase your expertise and help lay down more foundation of your expert status because it will be added to your professional profile. Your post could reach a broader audience in your industry AND online because it is searchable both on and off LinkedIn. LinkedIn members who are NOT in your network connections can follow you and your posts. This will build trust, warm up more leads and eventually make a much easier connection for you in the future. This post can be shared across other social networks for even more visibility. Information is power! LinkedIn has connected this published post to your analytics page. All you have to do is check that page and see how much attention your post has received. Use this information to tailor your future posts on and off LinkedIn. So while I love that LinkedIn has created this publishing feature, it does provide another layer of work for us all, added to what I know is an already overloaded schedule. Plain and simple that’s a big no-no and as much as you would like to, you should avoid just reposting from your own blog. Due to lovely Google and SEO you need to have new, fresh content in order for it to gain any ranking at all. The answer? You need to create something new. But remember, new is compelling for ALL of your readers not just those smart Google bots that can sniff out identical work a mile (or a gigabyte) away. Start by redefining the idea of “original” content. It doesn’t have to be groundbreaking or something that you’ve never written before. Instead, take what you’ve already got and recycle into a fresh new post. What blog posts or guest posts do you have that you could pull content from or repackage? Create a list post using all old posts as a “best of” type series. Take other types of content such as course materials, audio or video and have it transcribed. Pull your content from there. Breathe new life into content that didn’t get as much play as you’d hoped – give it a new seasonal spin, update with new information or present it differently. Take something like a trend you were discussing and do an update linking back to the original post. I think Maggie hit the nail on the head with her ideas and has given me the kick I needed to keep this going amongst all my other to-dos! I hope you do too. Need more info on these LinkedIn long-form posts? Click here. Haven’t been invited to publish yet and want to apply for early access? Click here. Want to take a look at my published posts? Click here. The first step you should take today? Join my LinkedIn group where you can ask me any and all of your Q’s that come up in the safety of our group. In this group we explore all these tricky topics and more! Second step today? 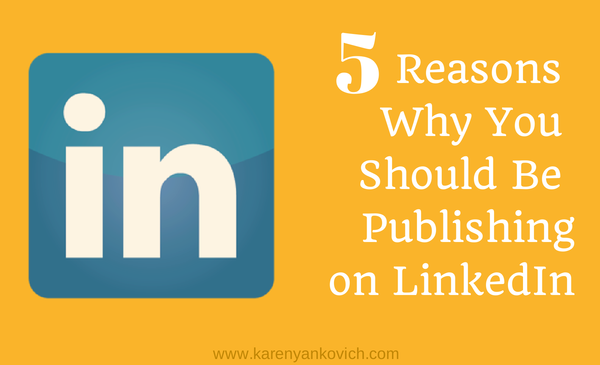 Read this again and decide what will be the topic of your first published post on LinkedIn. As always, to your success! Such great info Karen, how would this apply to videos? Or should I just post as is? Thank you for staying ahead of the curve and keeping us up to date. Feel the LI Love! You CAN add videos to LinkedIn! I would totally be doing that, your videos are so great. Karen, every time I read your stuff on Linked In I get that little nudgy, guilty feeling in my belly. I know I should be on LI more, I know it offers a huge untapped market, I just never seem to get there. I can’t quite convince myself that my particular business is going to gain traction via LI. Is that just an excuse? Not an excuse, just not where you are right now! Yes, I do think you have customers on LinkedIn, but YOU have to be comfortable there. Your customers will be comfortable with you where you are comfortable. Karen, I’ve often wondered if LinkedIn makes sense for me and the nature of my business. I do post all of my blog links there. Your list of ideas for repurposing posts is KILLER! I’m copying and pasting your tips to Evernote so I don’t forget them. Thank you! Cathy, you know how to find me if I can help! Funny coincidence that you should mention Maggie here. I just found her on FB and joined her group. I recently started by own blog and hope to repurpose the posts in the future. Thanks for the great tips! Wow, Karen, you’ve totally inspired me to get more active on LI, and given me the practical and actionable guidelines to take my content and make it work there. Thanks! That’s what I aim to do Holly! Ooo! That is good news. I love Maggie’s insight to write a “best of” type post made from other posts. That’s a great tip. I’m always learning my best LinkedIn tips from you, Karen. Thank you! what great tips from maggie – thank you, karen! i’ve been neglecting LinkedIn lately, and i’m not sure why – it’s been a great source of networking for me. time to get back to it, and add publishing to my list. Thanks for the Linked In reminder! Social media overwhelms me at times and I know I have to embrace this important component more..
Karen, you will be happy to know I updated my profile, now I am encouraged to do some posting 🙂 Thanks! I love reading your posts with tips and tid bits about Linkd In. It is a wonderful reminder of what a great resource it can be. Thank you for sharing and as always, loved the tips! You always make me feel like I can do it. I thank you for that. You rock my social media world in the best of ways. Thank you for your really great posts. Really. I can always count on you to provide great information regarding social media, Karen. I have to look through some of my older posts to see if there are any that I can revive. Hanna, you need to have an “all star” profile, last I checked. So anyone can do it, as long as they have a solid profile.